We spent just over a month in Methoni and during that time attended two local festivals - and very fine they were too. Number 1: the Navarino battle commemoration. Navarino (20 October 1827) was part of the early stages of Greece's battle for independence from the Turks. The battle didn't actually involve the Greek forces at all, but was a chaotic stoush between British, French and Russian warships on one side and Turkish and Egyptians on the other. All in the small harbour at Pylos, a very pretty little place about 10km from Methoni. It was a battle that wasn't meant to be - the warships were menacing, but not preparing for battle. But somehow shots were fired on the Turkish/Egyptian side and the others responded and all hell broke loose. But the British/French/Russians won and the local Greeks celebrate every year. The first signs something was up was military marching music blaring out of the high school across the way in Methoni the day before - the kids practising their marching, I suspect - so we made enquiries. The 190th anniversary. The following day Pylos was looking very festive, with British, French, Greek and Russian flags up all around the square and along the waterfront, and two battleships - one Greek (the Navarino, of course) and one Russian, both decorated with (naval, this time) flags. Proceedings started with a service at the church - every priest for miles around was present and there was lots of chanting and ringing of the bells in the square. Gathered outside the church was every secondary and older primary student in the area - lined up dressed in dark trousers/skirt and white shirt. 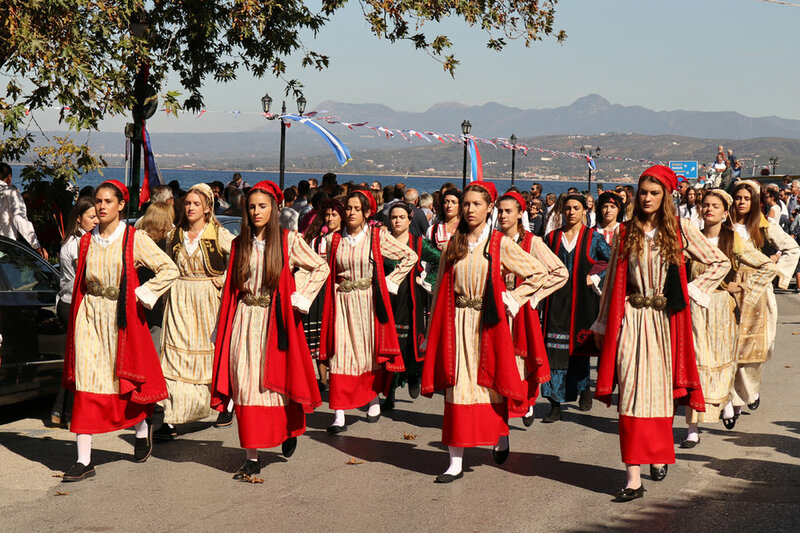 There were groups of young women (and a few men) dressed in various traditional Greek national costumes, and older women in more matronly traditional attire. There were three older guys with tunics and headdresses and lots cutlasses and muskets, which they fired off at regular intervals during the parade later. Just one gun going off makes you jump and alerts you a bit what it must have been like in a real battle. Then there were real military people - army, navy, air force, Red Cross. Quite a lot of bigwigs in suits, and a couple of dozen priests in their robes. It was very impressive. After the service everyone walked down to the seafront, where there were speeches and the laying of wreaths and playing of national anthems, and then the brass bands started and everyone paraded round the square, while the crowds cheered and clapped. Every chair in every cafe was full and much ouzo and coffee and lunch was consumed. It was all very splendid. In the evening there were fireworks and a light show - we think. We're not sure because we were told it all started at 9pm, but actually it was probably 8pm. By the time we got there, the main act was over, though a mocked up Turkish ship, with sails (an old fishing boat decorated for the occasion) was still burning impressively. It takes a while to completely burn a ship, we discovered. The Greek warship headed off with much blaring of ship's horn and a few more fireworks and it was all over. 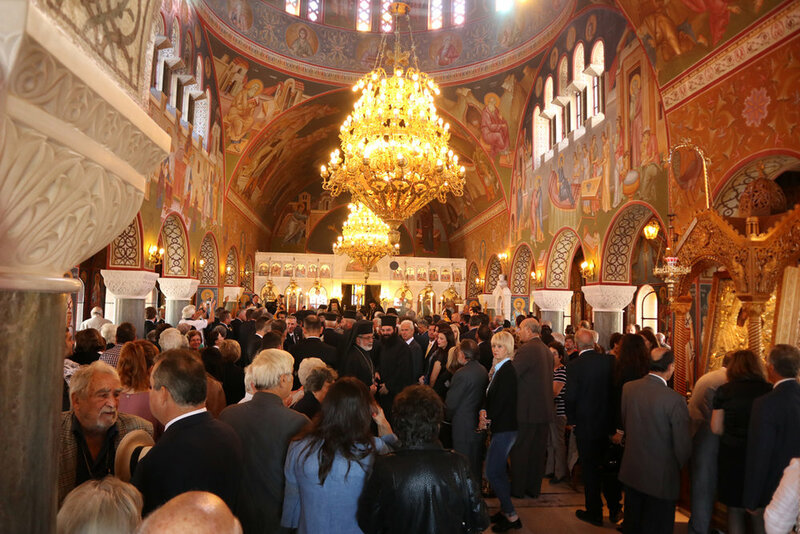 The second festival was a national one - Oxi Day. It celebrates the day (28 October 1940), when then Greek prime minister Ioannis Metaxas said "No" to his former mate Benito Mussolini. Mussolini wanted to allow Italian/German forces to enter Greece and occupy certain unspecified "strategic locations" or face war. Metaxas didn't actually say "Oxi!" (no), but instead "Alors, c'est la guerre" ("Then it is war" - not sure why he was speaking in French), but Greeks took to the streets shouting "Oxi! And since then it's been a national holiday. Methoni's festivities are I suspect fairly muted compared with bigger places, but still good fun. 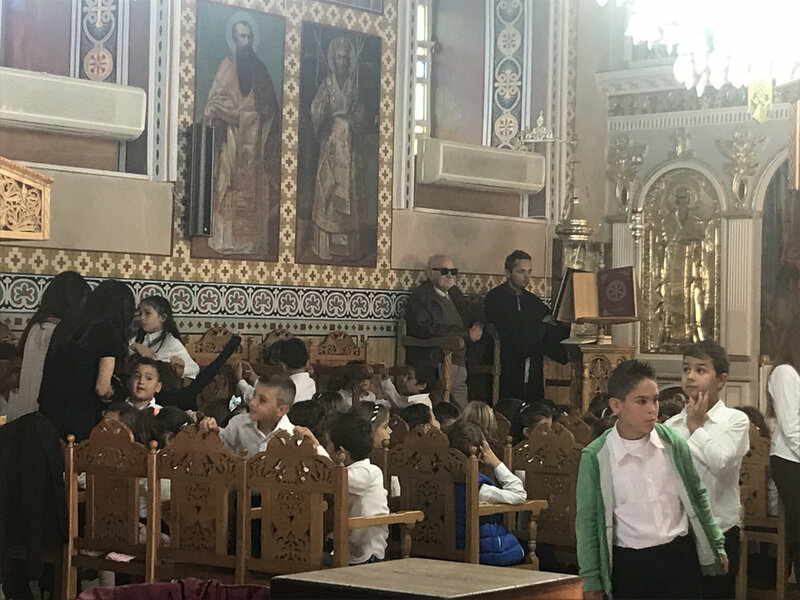 Again, it all started with a church service - actually two, one for the main population and another for the school children. Here the kids are in the church just before it started. Then we all walked to the main square, where the children marched past - even the little tiny ones - it was SO cute. And then there were poetry readings from selected students, very moving, though we understood not a word. And ouzo was drunk, and olives eaten, and everyone got a free piece of Turkish delight (except I suspect it isn't called Turkish delight in Greece) and we all went home.